Do you want to contribute to this plugin? You are MORE than welcome to do so, please leave a message here either with your ideas or with your username on java.net so that you can be added as a committer to the project. I tried it on stable 7.3. I installed the plugin, I pointed to play framework, I created a project and I tried to run it. It does the same when I try to use autocompletion. Anyway, instead of creating a project, can you try to open one of the samples, such as the one that you can see in the screenshot above, that comes with the Play distribution? I'm curious to know if you'll get the same error then. PS: Possibly the Scala samples and Scala projects don't work right now. Could you try the Java samples and a Java project instead? I'll be blogging about Scala, Play, and NetBeans IDE 7.3 soon. No, even with Scala projects, there's no problem at all in compiling. 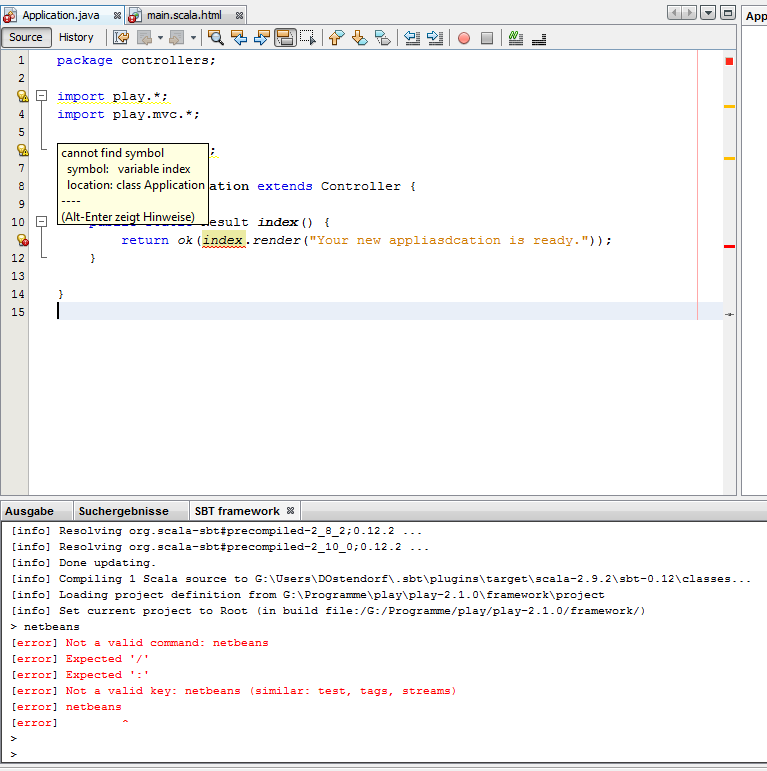 However, code completion doesn't work, unless you have the NetBeans Scala plugin installed, more on that in another blog entry. Identified the problem and fixed it. Better solution is needed, but please download the the plugin again and try again, for me, I can see code completion working fine now. I removed the old, then I installed the new plugin. I added your settings into project files and I was able to run it. The problem is that it doesn't see all the classes. I tried to open one of the samples and it's the same. I created an empty project. It worked like that. Still, it can't find some methods/classes/packages. One more question: what about templates? Right now NetBeans doesn't seem to like it. It shows many html errors. Is it because I don't have Scala plugin installed? What does "doesn't see all the classes" mean? And what does "it can't find some methods/classes/packages"? Does it mean that code completion doesn't work for some (which?) classes? Does it mean that red error marks are shown for some (which?) classes? What does "it doesn't find 'index' mean"? Red error marks? What, exactly? "I tried to open one of the samples and it's the same." -- which sample, specifically? Can you help me by giving me steps to reproduce what you're describing? Ah, seeing the problems now -- all classpath related. Working on fixing them. Glad to see that you found the errors. Does the plugin only support play 2? Or play 1 as well? Are you using the latest package from plugins.netbeans.org? if so, it's ok. Or if it's from sourceforge.net, you'll need nbscala-7.x_2.10.x-1.6.1.1.zip instead of nbscala-7.x_2.10.x-1.6.1.zip. The newest one, I fixed some issues related to multiple sources folders under Play!, for example, managed_sources. And you may also need to clear/delete NetBeans cache so as to let NetBeans Scala module re-scan/indexing them. yea, I added some new dependencies, but no code completion. I also tried checking out and building with no sucess... I guess I'll wait for an update. Brian, can you be slightly specific so that I can try to reproduce your scenario? Hi Geertjan, can you please advise how to get rid of red errors such as import package play.data. * and using the Form class in the sample project Zentasks? Is necessary to install scala plugins for java projects? Hi Geertjan, Could you add an update xml. so one can get updates as soon as they come? I'm looking into play and having been a long-term Netbeans user, I thought things would be pretty straightforward. Second, I've installed the plugin that this page mentions and I too am having a raft of CLASSPATH issues with packages and classes not being found. I can send screen shots and more than happy to pitch-in where I can to help resolve this for the platform. has anyone been able to fix this classpath issues? Are any of the commenters here interested in contributing code to the plugin? That would help a lot to improve it, it's definitely not complete and a work in progress. in "BootClassPathImplementation", line 55, there is a hard-coded reference to Scala 2.9.1 - My install, a recent one is 2.9.2 so I'm guess that's part of the problem. The issue then is how to avoid using hard-coded pathing like this? I am interested in Java and Play development and planning to contribute to this plugin. Just one question - is this plugin forward compatible with NB 7.4 and onwards? Because, I hate to work on "legacy" stuff. Thank you for this plugin developed. I'm a fan of NetBeans and Play framework. Unfortunately some of the files included in the creation of a Play project with this plugin are no longer compatible with the latest versions of Play as the latest Play 2.2.1 October 2013. I changed some files and give them to you below. Please could you recreate a release of this plugin with the changes that I give you, because I have no idea how to do this in NetBeans (creating a plugin). Thank you in advance. Unfortunately some of the files included in the creation of a Play project are no longer compatible with the latest versions of Play as the latest Play 2.2.1 October 2013. I changed some files and can send you 3 files that change. Please could you recreate a release of this plugin with the changes that I give you, because I have no idea how to do this in NetBeans (create plugin). Thank you in advance. Picked up Play 2.2.1 and installed the plugin. Now, with complete respect, I understand that the plugin doesn't really support this level of Play. I tracked this down to a change the Play frameworks repository from "repository/local/play/play_2.10/" to "repository/local/com.typesafe.play/"
As I think has already being mentioned, this is not the only change. Curios to know if this is the only place this might be a problem? you have done a woderfull job.But i am not able to add jar files in the netbeans play project and i am not able to get automatic prediction of classes while typing in it. So what can i do for that.can you give me solution for this. Wonderful plugin, many kudos for writing it. Due to the latest changes in Play framework, however, the path in settings for locating Play's installation folder doesn't work anymore. Consequently, the plugin cannot find the sources because 'play' command has been dropped in favor of a more generic tool called 'activator'. It would be great if the plugin is also upgraded to account for that? Thanks in advance.
" invalid home play path"